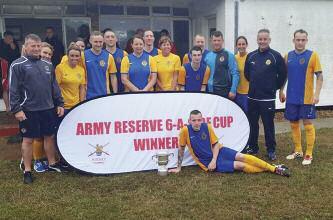 On 12 Aug 2018 152 (North Irish) Regiment completed a clean sweep at the Army Reserve National Football Six-a-Side Football Championships. 152 Regt won both the male and female crowns held at Grantham over the weekend of 11 to 12 Aug. The Deputy Commander Field Army and joint head of the Reserve, Maj Gen Bill O’Leary presented the winners’ medals and trophies.